The biggest domestic oil and gas boom in a generation is going unpoliced by regulators in many states, according to a report released today by the environmental group Earthworks. Since 2005, the United States has increased oil production by about 10 percent and gas production about 20 percent, largely due to technological advances in horizontal drilling and fracking. Meanwhile, enforcement actions in six major oil and gas states have not kept pace with all the new drilling. The report, “Breaking All the Rules,” examined oil and gas regulation in Colorado, New Mexico, New York, Ohio, Pennsylvania, and Texas. It found that in recent years the number of oil-and-gas-related enforcement actions and total dollar amount in penalties in each state have either remained fairly constant or dropped. The only exception was in Colorado, where penalties increased because the state addressed a backlog of old cases. Of more than 3,300 oil spills in North Dakota since 2009, the state has issued only 45 citations. To be sure, the Earthworks report does not offer a complete picture of the industry. Most notably, it doesn’t examine oil and gas regulation in North Dakota, Alaska, or California, which are, respectively, the second-, third-, and fourth-largest oil-producing states. 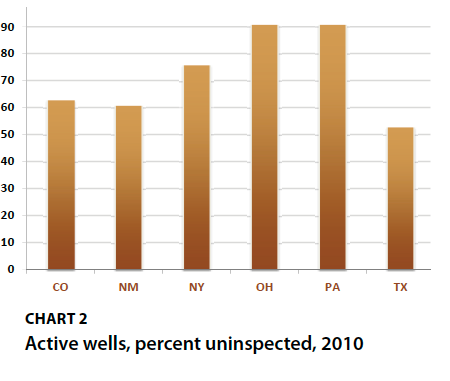 Those three states have better inspector-to-well ratios than the states in the Earthworks report, with North Dakota leading the pack with a ratio of 1 inspector for every 368 wells. Yet even that number has not translated into a stellar record of environmental enforcement. Despite more than 3,300 oil spills in North Dakota since 2009, the state’s industrial commission has issued only 45 enforcement citations. This recent ProPublica story exposed many of the gaping holes in North Dakota’s oversight of its booming Bakken oil field. Correction: Due to errors in the embargoed version of Earthworks’ report, the original version of this article stated that Pennsylvania levied about $1 million in oil and gas fines in 2010. The actual number is $4 million. It also incorrectly stated the year that Chesapeake Energy received a record environmental fine in Pennsylvania. The fine was levied in 2011.